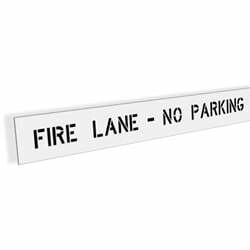 Parking Signs > Handicap Parking - State Signs > Michigan ADA Disabled and Handicapped Parking Signs > Fire Lane - No Parking Stencil - 74"
Make your parking lot Fire Code Compliant with our Fire Lane - No Parking Stencil. Our Stencil is 74 inches overall length with 4 inch tall letters. Fire Code requirements must be met by property owners to become a licensed facility. A pre-inspection is recommended and will provide information about building and fire code requirements. Generally, all curbs and adjoining fire lanes MUST be painted red. White paint should be used for the words "FIRE LANE - NO PARKING" which should be painted every 20 Feet. With our stencil, this makes painting the curb easier. Fire lane signs are also required and should be posted within 24 inches from painted curb. Fire Lane - No Parking Stencil Size is 74"x10"